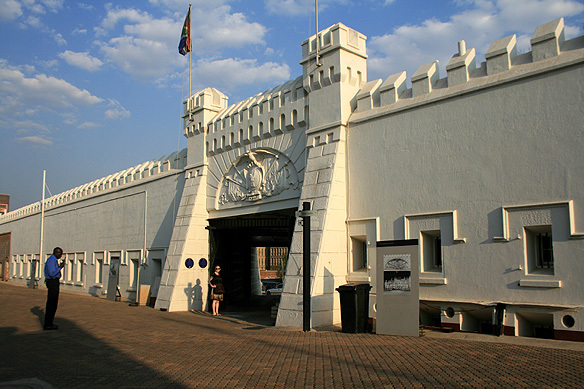 My travels in the province start with Pretoria, the de facto national capital and a city steeped in Afrikaner history. Pretoria has always been a capital, since its founding in 1855 by Marthinus Pretorius, leader of the Voortrekkers, who named it after his father. The Voortrekkers were the heroes of Afrikanerdom. In rebellion against British occupation, bands of Dutch farmers—the Voortrekkers or ‘pioneers’—left the cape in ox wagons between 1834 to 1854 together with their wives, children and servants to make the Great Trek across the interiors, beyond the Orange and Vaal rivers, and the Drakensberg mountains to eventually set up their own independent Boer Republics. 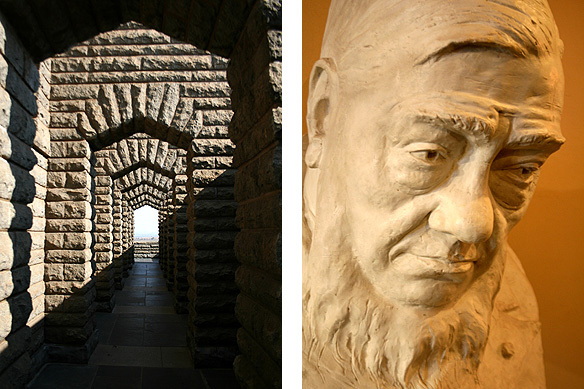 On the way they suffered many hardships and fought numerous battles against the indigenous Zulus that they encountered, tales which live on in Afrikaner literature and the 27 bas relief panels in the Hall of Heroes in the majestic Voortrekker Monument (1949). The modest Kruger House, once the home of Paul Kruger, president of the South African Republic and leader of the Boer resistance against British imperialism during the South African or Anglo-Boer War (1899-1902), was a lovely surprise. Homely and simple, it has been kept intact as it once was. Pretoria is rich in Victorian architecture with many fine buildings clustered around Church Square. Its best example, however, is the stately Union Buildings designed by Sir Herbert Baker. 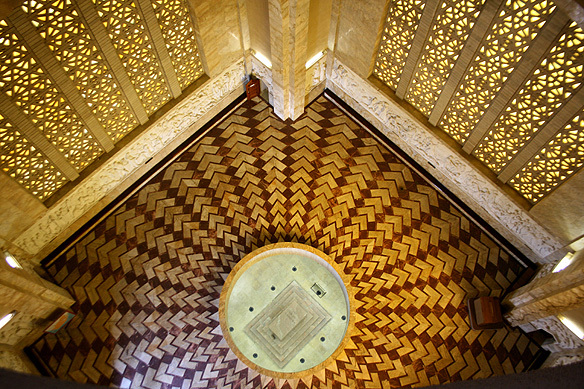 The perfectly symmetrical edifice was built in 1910 to celebrate the Union of South Africa, yet another chapter in the country’s history in which universal suffrage was excluded. In 1994, Nelson Mandela gave his inaugural speech as the president of South Africa here and Pretoria this time around became the seat of independent, Republic South Africa’s government. The Afrikaner Voortrekker Monument and bust of Paul Kruger, State President of the South African Republic and leader of the Afrikaner people. 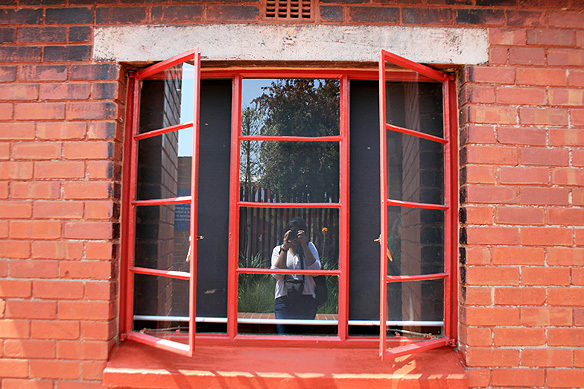 Self-portrait: Looking into the windows of Nelson Mandela’s house in Soweto. The one place every tourist to South Africa wants to [and should] visit is Soweto or South Western Townships [its full name]. Soweto is the by-product of the discovery of gold in the area, the subsequent garnering of black labour to work in the mines, and the Group Areas Act of apartheid which forcibly removed blacks from the city centre and placed them on its fringes. 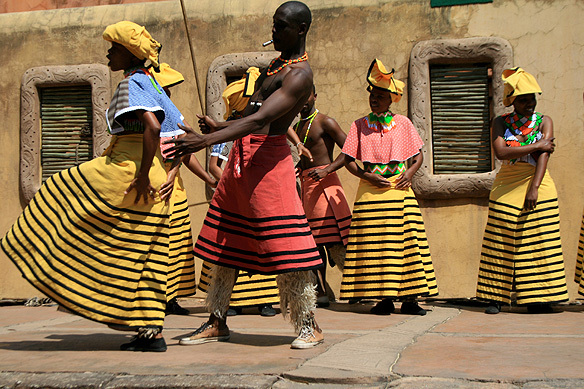 Visiting Soweto is an experience in itself. With a population of 3 million, it is immense, setting trends in black fashion, music, sports and politics. 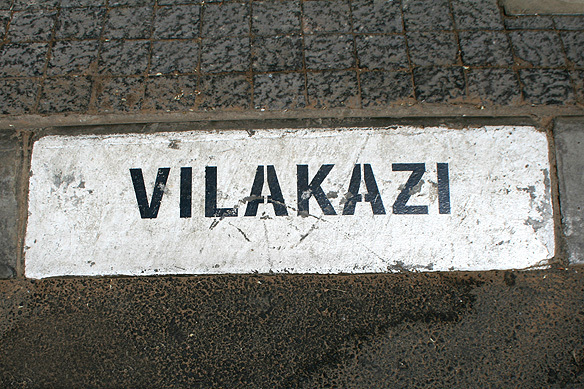 Its most famous street is Vilakazi where two noble prize winners had their homes, but a few yards from each other—Nelson Mandela and Desmond Tutu. 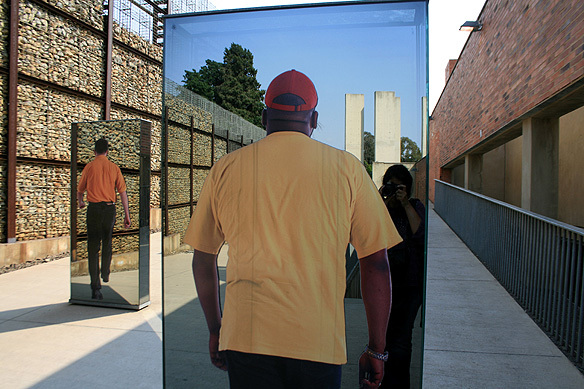 The township’s main claim to fame in the international arena is the role it played in the fight against apartheid, particularly the Soweto Uprising on 16 June, 1976 and the shooting dead of the 12-year-old child, Hector Pieterson, by the apartheid police which created a worldwide outrage against the atrocities being carried out within the country. The memorial site and museum dedicated to these events are raw and painful in their depictions. It seemed impossible not to get a lump in my throat or for my eyes to mist over. For a lighter note, I found Soccer City, loud music, and an incredibly close-knit community which gives Soweto its much-needed strength and resilience. 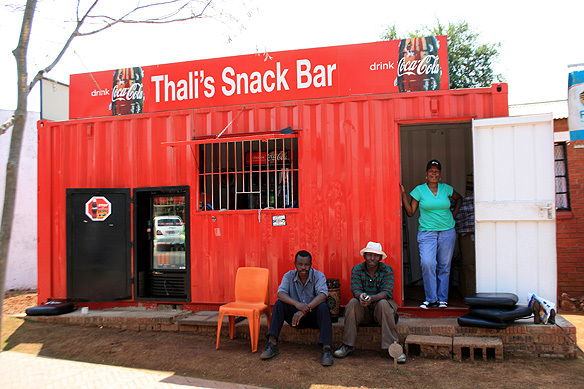 A typical snack bar shop on Vilakazi, Soweto’s most famous street which houses the homes of two noble prize winners and leaders of the anti-apartheid struggle: Nelson Mandela and Desmond Tutu. Jozi, Jo’burg, Egoli are but various names South Africans fondly call Johannesburg by. Jo’burg [which is what I call it] is multifaceted: steel and glass, freeways, splendid malls, elegant neighbourhoods, the trademark gold mine dumps, a chaotic downtown, hours in the traffic, beautiful weather, and people from every part of the world and all parts pf the country. Dig just a little bit, and there is also history, art, great food, award-winning museums and regular performances by international and local artists. It is a world city with world-class amenities and infrastructure and its airport is my favourite. 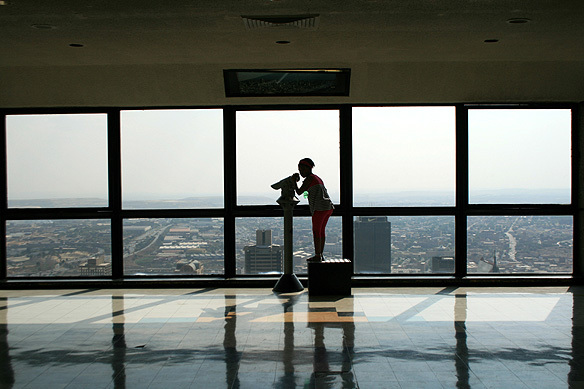 Johannesburg is not an old city. It was founded in 1886 following the discovery of gold by the surveyor George Harrison, and grew rapidly from a dusty settlement strewn with tents to what it is now. I had a tough time trying to find a city tour! I eventually managed to find one and went up to the 50th floor of the Carlton Centre in downtown for gorgeous views of the city, explored Constitutional Hill with its prisons and the Constitutional Court of the new South Africa which gives all its people equal human rights, and stopped by Mandela’s house in Houghton. No, we didn’t go in for tea. 😉 Gold Reef City and the Apartheid Museum were my second day where I wandered on my own and got to go underground into a defunct gold mine and was bombarded by sights and sounds of the most perfect record of the apartheid era. The myriad facets of Johannesburg [from top to bottom]: The top [50th] floor of Carlton Centre, the roof of Africa; The controversial Old Fort at Constitutional Hill, a prison where Mahatma Gandhi spent time as well; Traditional dancing in Gold Reef City, a theme park built on a defunct gold mine; and lastly, the award-winning Apartheid Museum. When history says life started in Africa, it is absolutely right. And to be even more accurate, it started in Eastern Africa and Gauteng. Just 50 kilometres north-west of Johannesburg is the Cradle of Humankind, a UNESCO World Heritage Site. 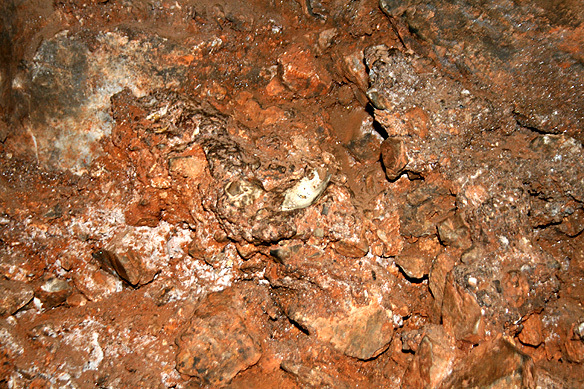 The site consists of a series of underground limestone caves, including the Sterkfontein Caves where some of the oldest hominid fossils dating back 3.5 million years have been discovered. ‘Mrs. Ples’, an impeccably well-preserved 2.5 million years old skull, and ‘Little Foot’, the most complete australopithecine found to-date averaging 4 million years old, are two of its most significant finds that changed accepted theories on human evolution forever. 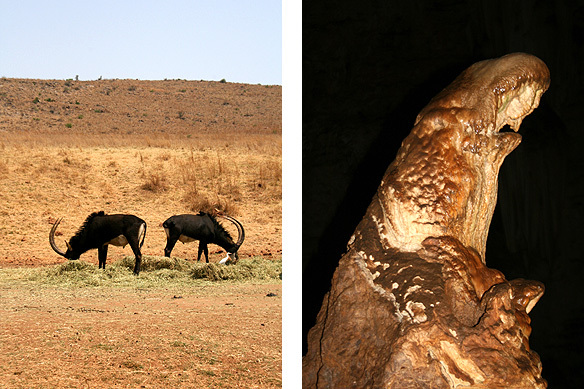 Cradle of Humankind: Sables in the Rhino and Lion Nature Reserve, Madonna in the Wonder Caves, an embedded fossil in the dolomite rock of Sterkfontein Caves. This entry was posted in Exploring our World, South Africa and tagged Afrikanerdom, Anglo-Boer War, Apartheid, Boer Republics, Egoli, FIFA, Gauteng, Gold Mining, Great Trek, Hector Pieterson, Johannesburg, Jozi, Kruger House, Little Foot, Mrs. Ples, Nelson Mandela, Paul Kruger, Pretoria, South Africa, South Africa History, South African Tourism, South Western Townships, Soweto, Soweto Uprising, Things to do in South Africa, UNESCO World Heritage Site, Union Buildings, Vilakazi, Voortrekker Monument, Voortrekkers by Rama Arya. Bookmark the permalink. you were? What did you explore? Do let me know whenever you are next in town. It will be great to catch up! Haha. No travelogue with this trip. 🙂 It was pure masti. Travelogue will be from the return trip.